My least favorite part about making breaded cutlets is standing at the stovetop frying them. Even with two large pans going, I can never get away with cooking all of the pieces at once. Stovetop frying demands monitoring — adjusting the temperature here and there, replenishing oil as needed. 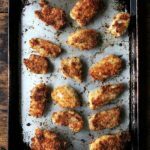 This is why I love the chicken fingers recipe in A New Way to Dinner, the latest cookbook from Food52’s Amanda Hesser and Merrill Stubbs. 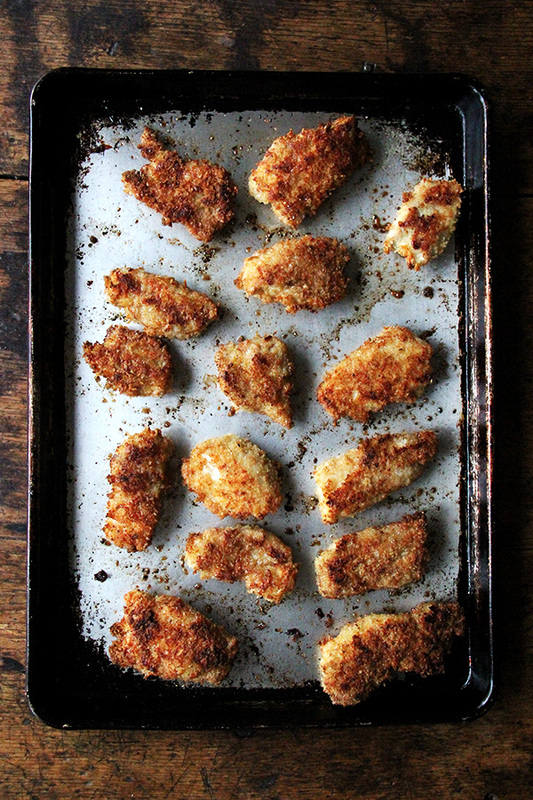 The breaded strips of chicken bake on briefly preheated sheet pans. After 20 minutes (with a flip at the 10 minute mark), they’re done — there’s no monitoring, no oil replenishing. Why have I never done this?! 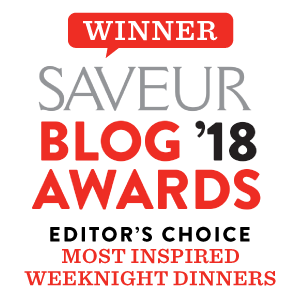 In the recipe notes, Amanda describes these as “the best chicken fingers on earth,” crediting the use of thighs (as opposed to breasts) for more flavor and the inclusion of both parmesan and oregano in the seasoning. 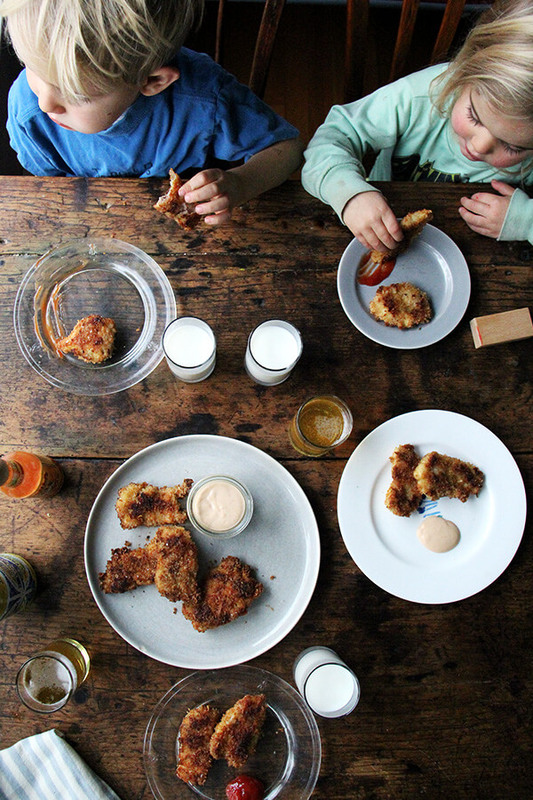 I have to confess I’ve yet to use the oregano — the little people in my house might protest — but even without it, these chicken fingers are utterly delicious. The crust gets incredibly crispy thanks to both panko and parmesan, which browns so nicely, and the meat remains juicy. I’ve been making a “special sauce,” A&M’s suggested condiment if you intend to make sandwiches — for the adults and squirting ketchup out for the littles, who would be happy if I never made them anything else for the rest of their lives. Winner winner chicken finger dinner! Adapted from Food52’s latest cookbook A New Way to Dinner, which has already being put to great use: I’ve made the shaved Brussels sprouts salad with anchovy dressing, Tad’s roasted potatoes (seriously irresistible), spicy roasted cauliflower, and I have the ricotta gnocchi shaped and ready to be boiled then browned with Brussels sprouts, sage, and pine nuts. I’ll keep you posted! 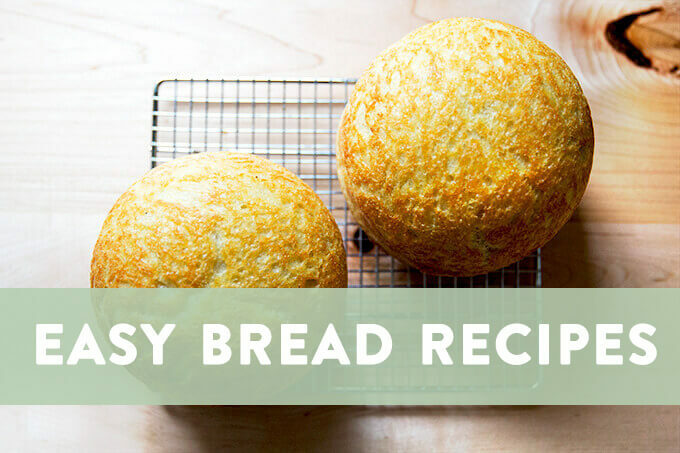 Note: The original recipe calls for the traditional flour-egg-breadcrumb assembly, but I’ve combined the flour and the eggs with a little water — my friend Holly taught me this trick, and I use it often when breading to save time. I’ve also adjusted the quantities of panko and parmesan to account for using 2 lbs. 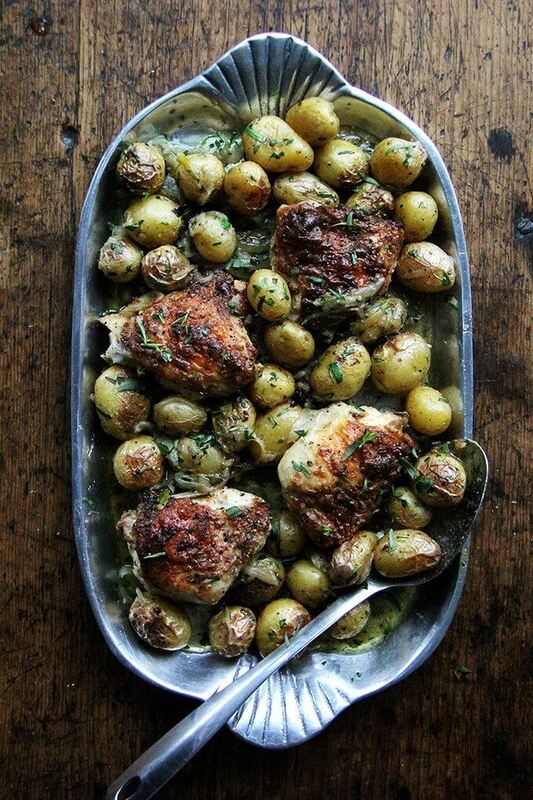 of chicken thighs, but know that you can’t really go wrong here. The original recipe calls for 3 lbs. of chicken, 3 cups panko, and 1 cup parmesan. It also calls for fresh oregano, which I’m sure would be delicious, but I was worried about offending the little people in my house. If you want to follow the recipe exactly, it’s here on Food52. 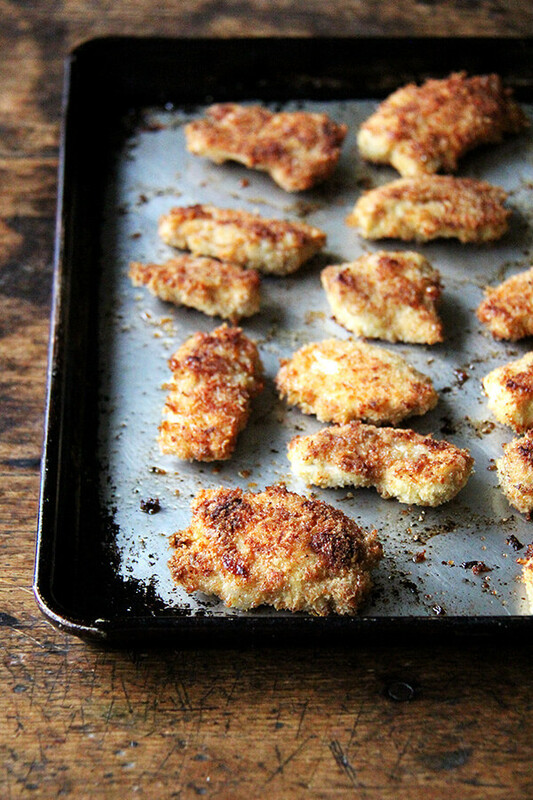 Also, if you want to make the chicken fingers ahead of time, you can. Store them in the fridge, then reheat on a baking sheet at 300ºF uncovered until heated through. This book, if you are unfamiliar, is all about preparing ahead — making lots of things over the weekend to use in various meals throughout the week — so it’s filled with lots of good information in this regard. One of the suggested uses for these chicken fingers are a sandwich with pickles and a special sauce, which sounds incredibly delicious. Set your oven to 450ºF. Whisk together the eggs, flour and water in a large bowl. Season generously with salt and pepper. 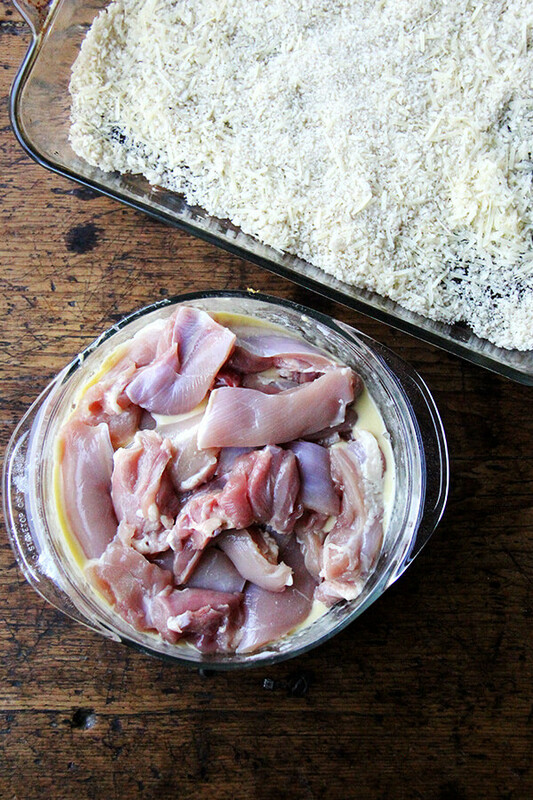 Toss the panko and parmesan together in a 9×13-inch or other large vessel. Have ready another sheet pan or large vessel for placing the coated chicken pieces. Drop the chicken strips into the bowl with the egg mixture. 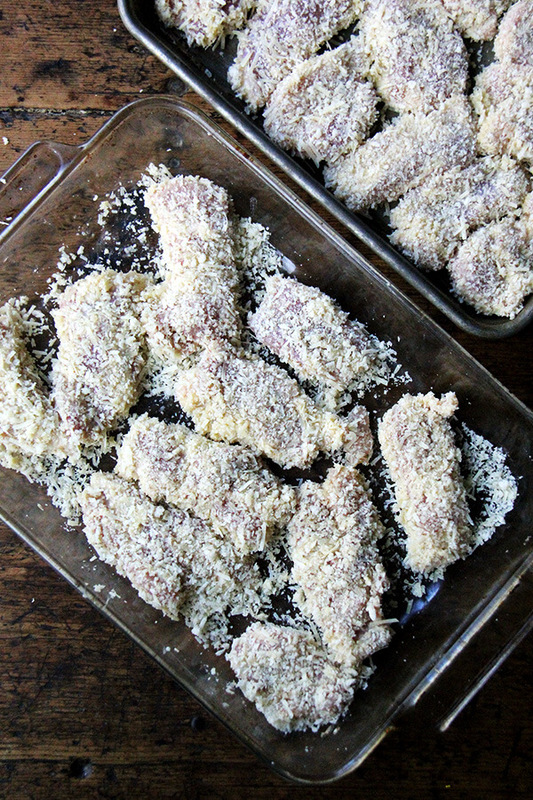 Toss to coat, then transfer a few at a time to the panko-parmesan pan. Coat in the crumbs, pressing them to adhere, then transfer to the clean sheet pan. At this point, the breaded strips of chicken can be refrigerated for up to a day (maybe longer). Wow, so interesting! I absolutely will! The oven trick is a game changer. Thanks for writing in! 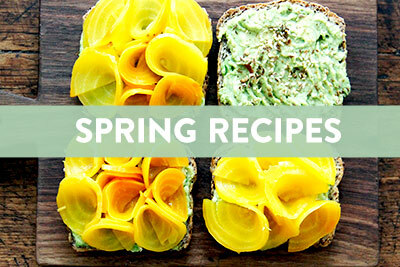 I know this is a family-friendly blog, so I will suppress the urge to swear, but…holy YUM. I’ve had these marked since I read that recipe too! They look so darn good. 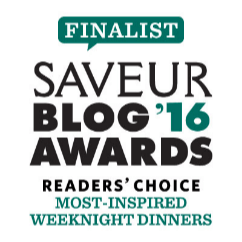 You may have swayed a dinner this week….. I was going to try a chicken shwarma recipe….but this one looks like the kind of tasty/easy combo I need right now. You are a rock star Ali! Ooooh, let me know how the chicken shwarma turns out! And thank you, Dana! I always assumed your littles ate things like kale and spinach all the time. But seriously, these look awesome and I’ll definitely be making them for B.
Haha, I love it. They wouldn’t touch those dark leafy greens with a ten-foot pole. I hope B approves! I’m excited you’re stepping out of the box. I have gone gluten free. 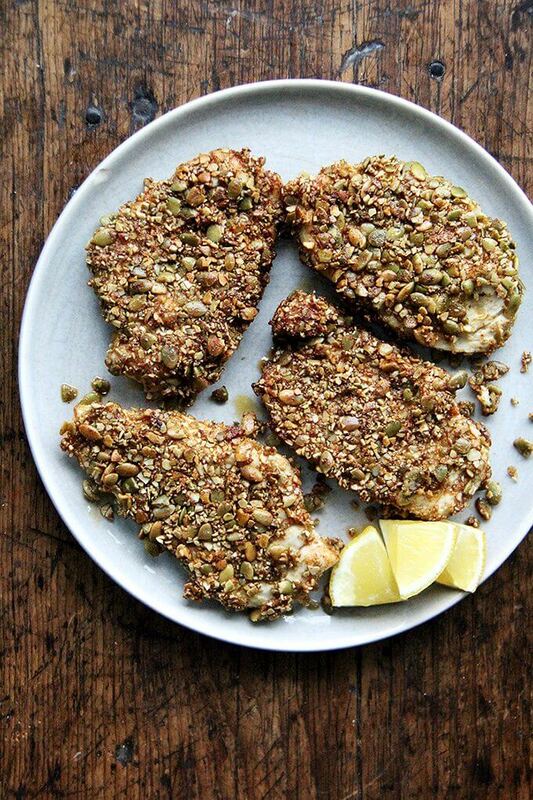 Last night I oven fried chicken fried steak in the oven, 350 degrees F, for 35 mins, it was cubed steak from Whole foods, in almond flour seasoned with Weber’s GF Kick’n Chicken, sea salt _ white ground pepper. First dip in the flour, then 3 beaten eggs, then again in the flour. I did not have to turn it, it was on parchment paper on a large baking sheet,. You brush the parchment with melted butter, lay the steaks (4) on top of the melted butter, then with a teaspoon drizzle more melted butter on top generously. The second large sheet had red potatoes cut in wedges, tossed in melted butter, salt & peppered, never turned, cooked about 25-30 mins. I cannot eat any oils at all, I am checking into coconut oil, we’ll see, I am diabetic, eating by Critical Health News. com, no meds at all, and I am doing well. Thank you, I love yr recipes! P.S. The steaks were tender, moist, & no oil to toss, I am free!!! Thanks so much for all of this, Laura! No turning is so nice, and your sheet pan supper sounds lovely. I hope coconut oil is safe for you — I love its flavor. Thank you for the kind words! I’ve been making it with chicken tenders and it’s not too dry. The recipe posted at Food52 says you can use either. Thank you for pitching in here, Sally! Nancy — I haven’t tried breasts, but when I make cutlets stovetop, I always use breasts, and I pound them first so that they are 1/2-inch thick and cook evenly/quickly. So I think Sally’s right — breasts or tenders will be fine. You’ll probably just have to adjust the timing a little bit — the breasts will take less time. 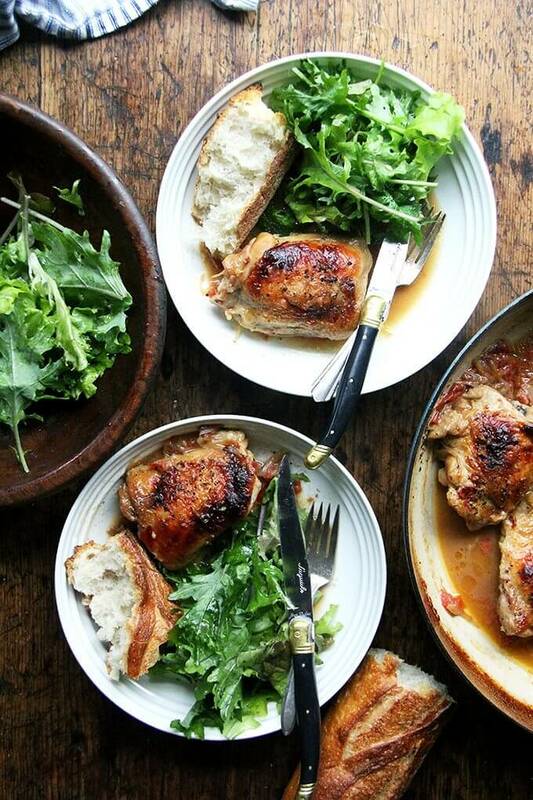 I first saw this recipe on Food52, just prior to the book being released. 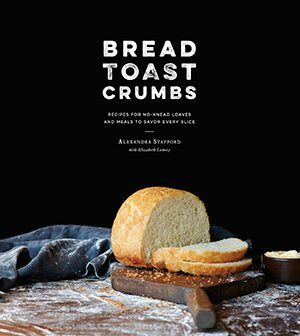 It is one of two recipes I’ve found recently that have become favorites (the other is Peasant Bread). I particularly liked the list of ways to use the chicken fingers they gave: Chicken Parmesan, Chicken Piccata, Chicken Milanese among others. I made a Buffalo Chicken version which I put on a salad with blue cheese dressing. I’ve taken Lidia Bastianich’s suggestion to use dried oregano instead of fresh. In this recipe I used about a teaspoon. Next year I plan to grow some and dry my own. So great to hear this, Sally. Your buffalo chicken version with blue cheese dressing sounds so good! How do you change up the seasonings to make it buffalo chicken? Would love to make this for my husband. I omitted the Parmesan and oregano. I think you could add cayenne, but I don’t use it (ground cayenne gives me an asthma-like attack). When the chicken fingers were cooked I dipped them in a mixture of melted butter and Frank’s Hot Sauce. Oh my gosh that sounds amazing. Love Frank’s. Thanks for the tips! Quick question, please? What “neutral oils” would you use? Thank you in advance for answering! Hi Susan! I use grapeseed often but also canola or vegetable. If you don’t have anything, olive oil is fine. fried dishes – I’m a little bit of a fried chicken purist 😉 I used tenders instead of thighs since I already had some in the fridge, but your times were still perfect! What an easy dinner. And that sauce is SO yummy. So happy to hear this, Kelly! And I so appreciate being a purist on anything 🙂 🙂 🙂 so I’m especially glad you like these. Thanks for writing in! I cannot use the Parmesan so should replace it with some bread crumbs or corn flake crumbs? If not, what kind of Panko is best? What can I use in place of the butter? Cannot wait to try for my grandchildren! Hi Jean! I would simply omit the parm. Any panko will be fine — I buy whatever variety I see at the store. They are all pretty similar. In place of butter, I would just use more neutral oil. Good luck!